Inform you of where I can be reached via phone, fax or pager so that I can respond quickly to you for faster repair and return of my vehicle to me. (Inquire about our complimentary pagers, if needed, and leave us your fax number, if available). Wait for my vehicle only if the repairs can be done quickly. I realize delays can occur due to parts unavailability, slow parts delivery or additional needed repairs. Understand that telephone calls, estimates and auto repairs are suspended between 12:00 and 12:30 while your employees enjoy an uninterrupted lunch together. (This is a part of our team building emphasis). Make certain that you need only to communicate with one decision maker and realize that when two or more people are involved it slows the repairs of my vehicle and causes confusion. Understand that if I am late for my scheduled appointment that you may not be able to repair my vehicle that day since the specific time scheduled for my vehicle has elapsed and that it is not fair for you to cut into the next appointment of a customer who was there on time. Appreciate your reputation as a Blue Seal of Excellence High Quality Repair Facility and understand your business philosophy of respectfully declining to perform "patch repairs" on vehicles. Have a cooperative attitude and will partner with you in the repair of my vehicle. Not pressure your employees with unrealistic demands. This could cause your staff to be impatient and upset with the next customer which would not be fair. Respect your goal of building a long term trusting relationship with your customers and realize you will help me make decisions based only on my best interests. Thank You for selecting us for your automotive needs. 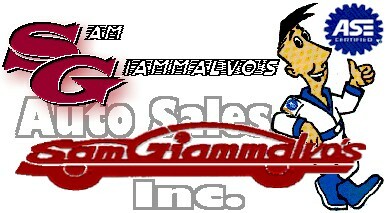 Sam Giammalvo's Auto Sales & Service Inc. "19th Century Craftsmanship Combined With 21st Century Technology"